Baby Food Supplies: 9 Things You Need to Meal Plan for Your New Eater! When my son’s paediatrician gave us the thumbs up for him to start testing out solid foods, it dawned on me that despite my degree in food and nutrition, and having a basic understanding of paediatric nutrition, I really didn’t have the skills or knowledge I needed to feed my little guy, which included being baffled by what baby food supplies I would actually need! First of all, there has been an absolutely explosion of products on the market in recent year geared towards parents for feeding their little ones. This includes utensils, accessories, kitchen gadgets and cookbooks. Not only that, but so much information in terms of nutritional recommendations had changed in a handful a years since taking my degree. I started updating my knowledge by first attending an “Introducing Solid Foods to Your Baby” workshop. I then hunkered down online during nap time trying to figure out what the best baby food supplies were, where I researched the highest reviewed bowls, plates and spoons to buy. Who knew there would be so many options? Now, almost a year and half after my son started eating solids, I feel like a pro and have a few quick tips to pass on for any parents who might feel as lost as I once did. Truly, there are only a handful of supplies you will need, and you will already own a few of them. Firstly, there are two main approaches to baby eating and menu planning – and you don’t have to choose between them, as we often shifted between them as our son showed interest in one or the other. There is the option to introduce pureed solids with the parent or caregiver providing them on a spoon to baby. There is also the approach of “Baby Led Weaning” where the child is in charge of feeding themselves from the first introduction to solid foods, and where parent or caregiver provides small, graspable pieces of very soft cooked foods for the child to pick up from their tray and eat on their own. Depending on whether you follow one approach over the other will depend on what baby food supplies you will require. I will assume for the purposes of this post that you may integrate concepts of both ways of feeding your baby. The first things you will need will be a high chair, easily cleanable bibs (we loved the Bumkins bibs that can be rinsed off), and plenty of washcloths for the wipe down you will be doing after every meal (regardless of which approach you choose!). We invested in a couple of bulk packs of washcloths that we could use for this purpose and just added them into our daily laundry loads so that we could avoid spending a small fortune on paper towels. 1. Resource Books! I bought one book that talked about each theory, but you may also find these in your local Library as well. I still enjoy using some of the recipes from these today. For the traditional approach to feeding your little one purees from a holistic nutrition perspective, I recommend Sprout Right. If you are interested in Baby Led Weaning, I only bought the Baby Led Weaning Cookbook as I found that it covered a significant amount of the theory within it before diving into the recipes. This, coupled with reading many online resources, had me feeling confident and up to date in my knowledge. If you happen to have new parent groups in the area, they will often run Baby Food Making workshops, or even Introducing Solid Foods workshops that would be helpful to attend. I also recommend attending an Infant CPR class as well to be aware of choking issues and how to handle them. 2. Spoons that where gentle on baby’s gums & could be chewed on by baby without hurting them (if they aren’t already teething, they will be soon, and with teething comes increased chewing). If the spoon has a nice, shallow slope to it for small amounts, that is also helpful. Some spoons can even detect if the food is too warm for baby! 3. Bowls that were most helpful were plastic, had an edge to scrape off any extra food from a spoon, and that had a silicon no-slide base. We generally found that bowls with suction bases were not effective (rarely did they actually stick), and only attracted more plate grabbing from our little one. But you also don’t want a bowl that slips and slides right off the smooth surface of the high chair tray or table when your baby awkwardly reaches for it. Having a little bit of grip on the bottom of the bowl was a "plus". 4. Plates can be about as simple as needed. Because these don’t sit as high off the tray or table, our little one often didn’t bump into these as much, so no fancy equipment or silicon bottoms were required here… just something that won’t crack or break if thrown (which happens as part of testing how the world works!). 5. Blender, or even a masher, for making pureed foods. We simply used the smoothie attachments for our existing blender for doing smaller batches of foods when in this phase. A baby food blender is most definitely not required! 6. Freezer storage containers for storing extra pureed foods, if you are making them yourself (which is so much cheaper to do). I often found the ice cube trays hard to get food out of, and the plastic “convenience” bags where food can be squeezed out often wasted a lot (as much of it couldn’t get perfectly squeezed back out). The best option is to have small, freezable containers that will hold a few tablespoons of food you can feasibly use up within 2-3 days. Most grocery stores carry plastic freezer safe containers you can buy fairly inexpensively as well. 7. Sippy Cup! My little guy had one heck of a time finding a sippy cup that made sense to him, and he was already familiar with bottles. 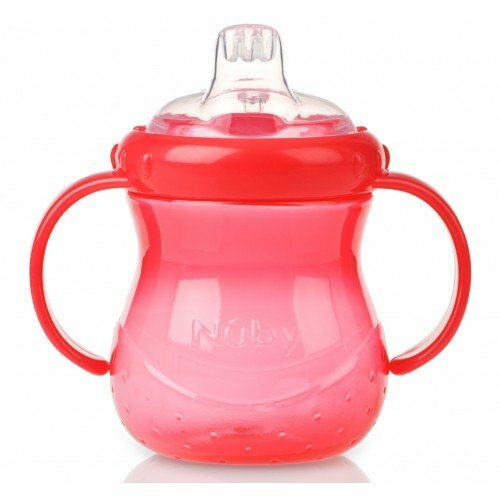 The one that ended up working for him, and that I have gifted to several friends who also had great success with it is the Nuby Sippy Cup. I also love how easy it is to clean, and that you can buy replacement parts for it if you use it for future kids. 8. 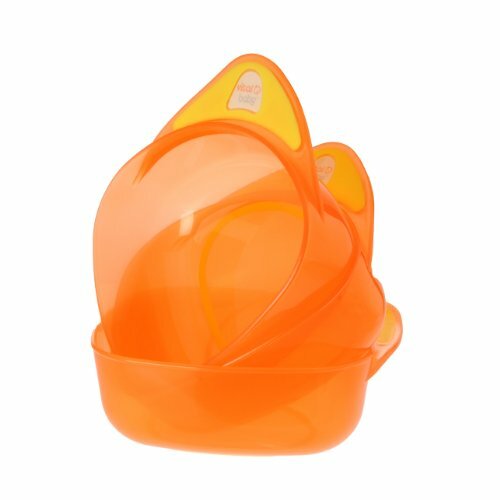 A steamer basket for either cooking foods to be very soft for baby to pick up and eat, or if you plan to later puree foods. 9. Kitchen Shears are so helpful for cutting up food for your little one (multiple pairs for meals, and maybe even a small pair tucked in a safe pocket of the diaper bag). Even if you start with purees, one day your baby will let you know they are interested in trying what you have in your hand! Also, keep in mind there are a few foods that happen to be particular chocking hazards as they are the exact width of your little one’s windpipe (1-1.5 inches), including grapes, hot dogs, bananas and carrots. Just make sure you cut them a bit smaller. Also, keep in mind that you will also need to restock your diaper bag with a few items for eating out now that your little one is joining in on the fun. Things to have on hand might include a travel booster seat, a silicone mat/plate, a portable bib and maybe even a few snacks. 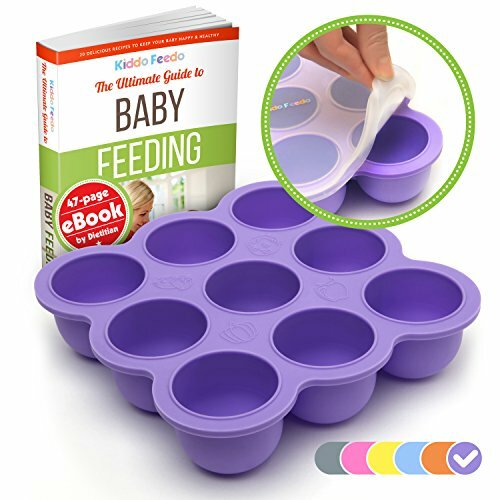 What other nifty inventions have you seen out there for baby food supplies? Is there anything else you think you might need to feed your little one?